The CAMSS 30CP is ideal as a command post for your operations. Several other shelters can be connected to the CAMSS 30CP by its many boot connectors. The 30CP is a variant of California Medium Shelter System (CAMSS30) which is the Official Medium Shelter System of the United States Air Force, and is widely depended on to support troops around the world. Because of the CAMSS30’s extensive testing and real world usage you can be sure that the CAMSS 30CP will be able to handle any environment or situation. The CAMSS 30CP is ideal as a command post for your operations. Several other shelters can be connected to the CAMSS 30CP by its many boot connectors. 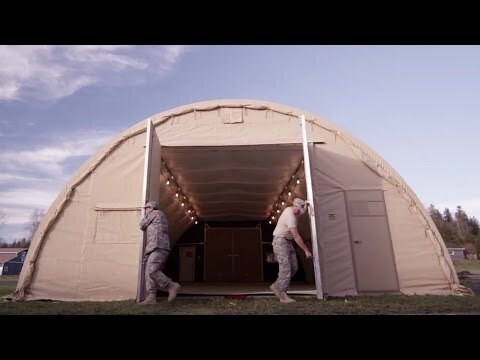 The 30CP is a variant of California Medium Shelter System (CAMSS30) which is the Official Medium Shelter System of the United States Air Force, and is widely depended on to support troops around the world. Because of the CAMSS30's extensive testing and real world usage you can be sure that the CAMSS 30CP will be able to handle any environment or situation.